Here we are, smack dab in the middle of summertime. Around here, that means we're in the middle of a heat wave. So when I want a special dessert, I crave something light and refreshing. Cue the angels singing; it's time for their favorite dessert. This is not just any old angel food cake, mind you: it's my grandmother's homemade angel food. Some of my fondest childhood memories were made in my grandmother's kitchen. Grandma was regionally famous for her angel food cakes, and for good reason: this is the most delightful angel food I've ever eater, hands down. True story: my grandmother always beat her angel food batter by hand (can you believe that?!). A couple of days before my wedding in 1985, she challenged me to an arm-wrestling competition. She was 68 years old; I was 21. She beat me without blinking an eye. This is her recipe. Angel food cake is made from just a few simple ingredients. I don't mix mine by hand, but my trusty KitchenAid is a pretty fair substitute for my grandmother's muscle power. There are two secrets to making a delicious angel food cake. One is to avoid any kind of grease or oil. Be sure that your mixer, bowl, and cake pan are completely clean. The other is to use the right flavorings: pure vanilla extract plus just a little pure almond extract. That flavor combination can't be beat. 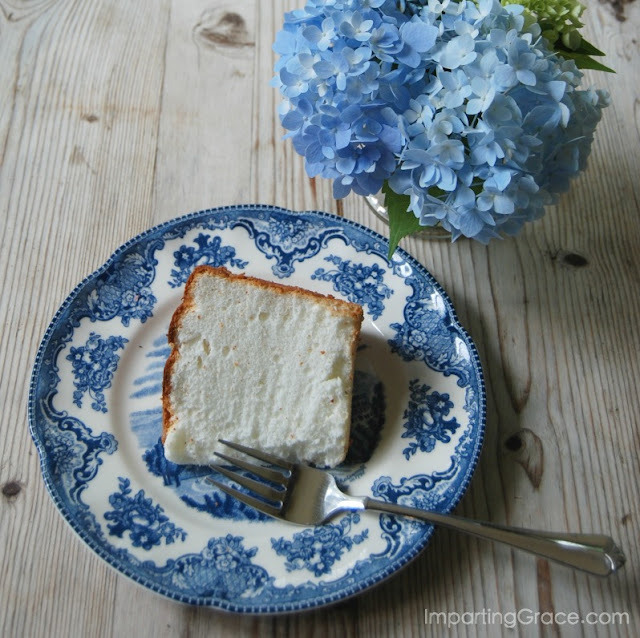 This is the best angel food cake you'll eat this side of heaven, I promise. 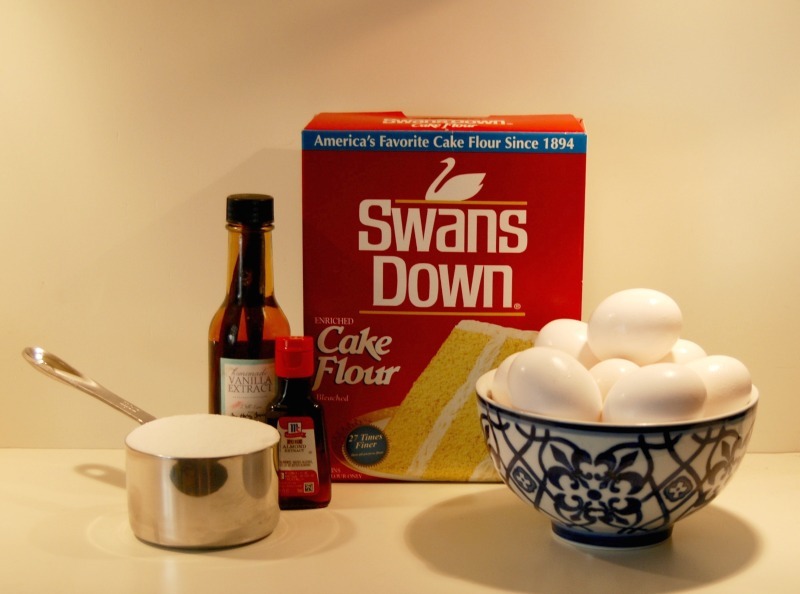 Sift the cake flour with 1/2 cup sugar 10 times; set aside. Beat egg whites with cream of tartar and salt until still enough to form soft peaks, but still moist and glossy. Beat in remaining cup of sugar. Sift one-fourth of the flour mixture over egg whites and fold in gently. Repeat, folding in remaining flour by fourths. Then fold in the vanilla and almond extracts. Spoon batter gently into a clean (UNgreased) tube pan. Bake at 375 degrees for 40-45 minutes. Remove from oven and invert cake pan onto a glass bottle to cool. When thoroughly cool, run a thin knife around the edges of the pan to loosen cake, then tap cake out onto cake plate. Cut slices with a serrated knife. Serve plain or with fresh fruit and whipped cream. Do you have a favorite recipe passed down from your grandmother? I'd love to hear! this looks delish - and what a pretty photo! I love things like this. It is even more special since it was from your grandma! Thanks so much for sharing it! Great post! We love visiting in your blog. 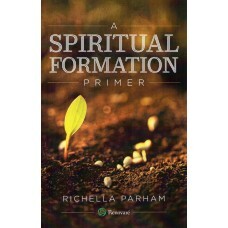 What a delightful story Richella!...I love Angel Food cake and thanks for the recipe! Unfortunately both my grandmothers passed away when my parents were children. I wish I had recipes from them....but treasure recipes from my mom and my hubby's late mother. 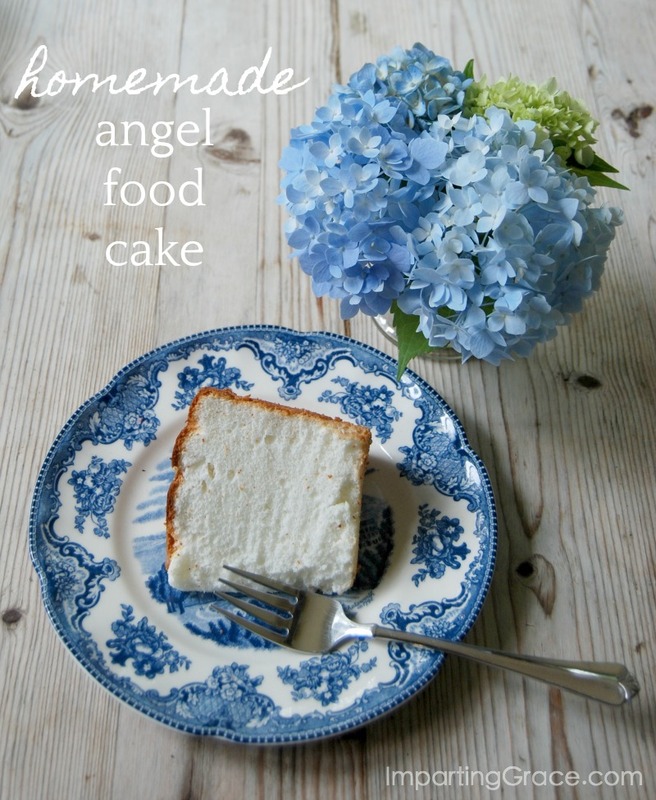 Love that angel food cake pic! I agree about the almond and vanilla together. I always put a bit of almond in my vanilla cake and frosting. Thanks for featuring my series!